Glowing with pale green phosphorescence, individual units of “Live Free or Undead” will be delivered in tightly packed cardboard boxes, pages still warm and moist from the Hyperborian presses, to a secure, labyrinthine warehouse on Oct. 14. Like viral cells, the books will then begin to stream through the semi-permeable membrane of the vast gelatinous network of independent bookstores to the gaping maws of the slavering reading public. And what is the soundtrack of this dark digestive ballet? It is the borborygmos of human voices, intoning aloud the spells and chants contained within the literary bowels of this granitic grimoire. Here’s a list of opportunities to listen in on the authorial readings of stories from Live Free or Undead. If you know of some bookstore or other public venue that would welcome the Undead into their midst, let us know. The readers stand by, ready to spread their contagion to unsuspecting ears. RiverRun October 20, 7 p.m.
Concord Literary Festival – Oct. 22 – Barley House – 5-7 p.m. Double Midnight Comics, Manchester, Oct. 27, 7 p.m.
Rye Public Library – Oct. 27, 7 p.m. Toadstool Books, Peterborough, Oct. 30, 11:00 a.m. Toadstool Books, Milford, Oct. 30, 7 p.m.
An anthology of short fiction in a horror vein written by local authors and set in the familiar locations of New Hampshire will appear in bookstores just in time for Halloween. “Live Free or Undead: Dark Tales from the Granite State” is being released by Plaidswede Publishing of Concord and should be available across the state by Oct. 14. The book presents 20 spine-tingling tales, some by first-time writers and some by such well-known New Hampshire authors as Rebecca Rule, Brendan Dubois, David Elliott and Hugo Award winner James Patrick Kelly. The book cover is illustrated by Dover artist Marc Sutherland and the whole project was edited by New Hampshire Magazine Editor Rick Broussard. Last fall, word about the project was spread via the NH Writers Project and various online sites for authors of fiction. Broussard says he expected a good response, but he was surprised by the quantity — nearly 170 submission came in from eager authors — and the quality. “I could easily have filled three or four books with great stories,” he says. “New Hampshire has always been home to some amazing writers,” says Broussard, “but there are fewer places for them to get started or to see their work in print.” To turn that trend around, Broussard came up with a concept that would connect local writers with local fans of genre fiction. 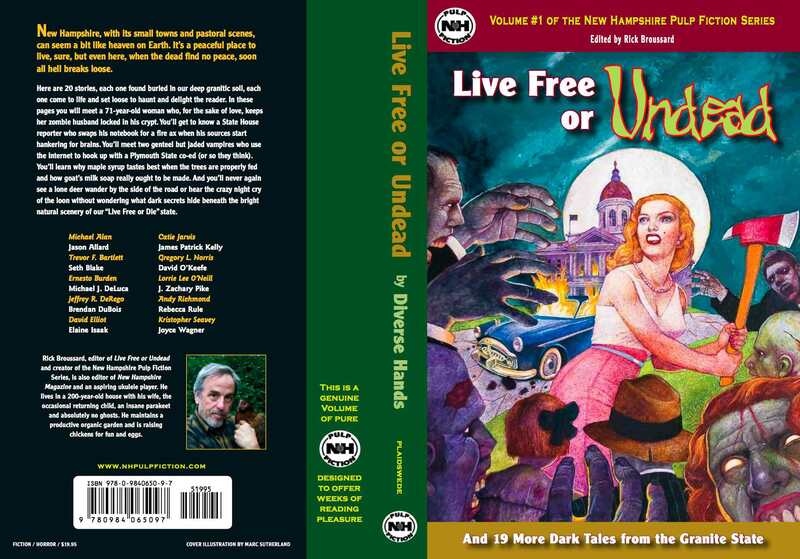 “Live Free or Undead” is just the first volume in the “New Hampshire Pulp Fiction Series” of books that will use the state as a backdrop for action-packed storytelling and as an inspiration for new writing talent. The next volume, tentatively titled “Live Free or DIE, DIE, DIE,” will feature stories in the genre of murder and mystery, also set in New Hampshire. “The writers who have been picked, both newbies and seasoned pros, are incredibly excited to have one of their stories appear in a book. I wanted to be sure that the book they were in was a thing of beauty,” says Broussard. Even if the cover is a picture of brain-eating zombies. The galleys for Live Free or Undead are prepared and heading off to the printer, so for better or worse (I predict better) the book is on its way to moving from concept to reality. Here’s the cover, with art by the brilliant Marc Sutherland and with all the author’s names embedded. There are readings planned for locations all over the state leading up to Halloween. I’ll post a list soon. Chances are you have already heard the news, good or bad regarding the selections I’ve made for the Live Free or Undead horror anthology. I’ve just written to the 20 authors whose stories were chosen and I’ve been leaving a trail of death and devastation among the rest of the contributors by sending out notices in sorties over the past few weeks. If you haven’t heard from me, the chances are your story was not accepted and I just either lost or garbled your contact information. Feel free to write me and ask if you haven’t heard, but don’t get your hopes up. The incredible number and generally high quality of stories I received for “Live Free or Undead” condemned many fine efforts to be cast into the outer darkness. A number of people have written to ask for critiques of their work to better conceive any future submissions. As soon as I have time, I’ll honor those requests to the best of my ability. I had to make my choices based upon my goal to have a number of styles and subject matter and even locales reflected in the final book, so in many cases there was no real “critique.” Just an editorial gut reaction determined to make the best book that I could. There will be a web site component of Live Free or Undead and the NH Pulp Fiction series and if you are interested in having your story included on that site, let me know. There won’t be any payment for this, but I’ll have profiles on each of the participating writers and links to their own sites, blogs, etc. Finally, this is the first edition of the series, and I hope you’ll consider submitting other stories to future volumes. Next in line will be a mystery anthology (title in development) and I’ll be seeking stories for that as soon as I have this book sent off to the publisher in late July. This winter, I hope to get the word out for the science fiction edition and then, most likely, historical romance. So the good news is that Live Free or Undead is alive (it’s Alive! ), and judging by the interest generated so far, should be a great start to the NH Pulp Fiction series. I’ll keep posting here from time to time to keep everyone posted on progress. Thanks for your patience and for your great stories.